As the twenty-first century dawns, China stands at a crossroads. The largest and most populous country on earth and currently the world's second biggest economy, China has recently reclaimed its historic place at the centre of global affairs after decades of internal chaos and disastrous foreign relations. But even as China tentatively reengages with the outside world, the contradictions of its development risks pushing it back into an era of insularity and instability-a regression that, as China's recent history shows, would have serious implications for all other nations.In Restless Empire , award-winning historian Odd Arne Westad traces China's complex foreign affairs over the past 250 years, identifying the forces that will determine the country's path in the decades to come. 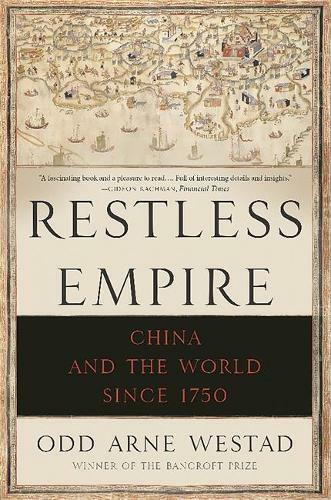 Since the height of the Qing Empire in the eighteenth century, China's interactions-and confrontations-with foreign powers have caused its worldview to fluctuate wildly between extremes of dominance and subjugation, emulation and defiance. From the invasion of Burma in the 1760s to the Boxer Rebellion in the early 20th century to the 2001 standoff over a downed U.S. spy plane, many of these encounters have left Chinese with a lingering sense of humiliation and resentment, and inflamed their notions of justice, hierarchy, and Chinese centrality in world affairs. Recently, China's rising influence on the world stage has shown what the country stands to gain from international cooperation and openness. But as Westad shows, the nation's success will ultimately hinge on its ability to engage with potential international partners while simultaneously safeguarding its own strength and stability.An in-depth study by one of our most respected authorities on international relations and contemporary East Asian history, Restless Empire is essential reading for anyone wishing to understand the recent past and probable future of this dynamic and complex nation.